First CRM to include full Marketing Automation functionality now offers free VoIP telephony integration with WebRTC and legacy VoIP providers using SIP. 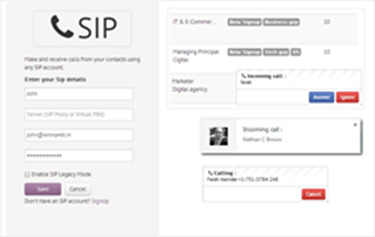 Sunnyvale, CA (PRWEB) - Agile CRM, a subscription-based SaaS product that went into open beta earlier this month, announces the beta release of its SIP Telephony Integration with both WebRTC and legacy VoIP providers. The integration is completely of no charge, even for free accounts. Agile CRM’s SIP Telephony Integration is the industry’s first bring-your-provider Telephony solution. Unlike traditional SS7 technology for telephone signaling, SIP (Session Initiation Protocol) is a peer-to-peer protocol that keeps things simple by eliminating the middleman. Agile’s seamless integration of the new protocol allows users to receive in-app and HTML5 notifications for incoming calls, make and receive calls, and integrate callers with new and existing CRM contacts - all without ever leaving the CRM dashboard. It increases productivity and eliminates the inevitable data leaks and lost leads that come when businesses use phone systems that are separate from their CRM. Beta customers have been raving about Agile CRM’s plugins and integrations. “I literally made three clicks and I was able to connect and immediately place calls, get actionable social media information, and view my emails in a stunningly nice way,” said Mark Valles, Sales Acceleration Expert at Infusion-4. More info about SIP Telephony Integration: https://www.agilecrm.com/voip.html. Created by the team behind popular live chat product ClickDesk, Agile CRM is the world’s first fully integrated sales and marketing suite- a CRM with full Marketing Automation functionality. The company launched in late 2013 and announced their open beta release in March 2014. In addition to their Sunnyvale, CA headquarters, Agile maintains offices in India and the Philippines. They are committed to open source development and the powerful simplicity of cloud computing. Agile CRM is free for the first two users, and after that subscription rates are extremely reasonable. More info: https://www.agilecrm.com/pricing.html.